With heavy hearts we announce the passing of Jean Marie McNevin on Sunday, June 10, 2018; at the age of 83. Loving daughter of the late Kenneth and Margaret (nee-Tait) Kyle, Jean is now reunited with her late husband George McNevin (2010). Beloved mother to George Brian (Nicole), John Gregory and Charmaine Marie Parsons (Chad). Cherished grandmother to Tyler, Amanda and Garrett. Great grandmother to Scarlett Jean Marie, Savannah and Joshua. Dear sister to Fran Kyle and Doris “Bunny” Oxton. 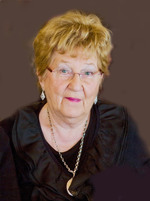 Jean was dedicated to her family and always was happiest when family and friends were together. She was dedicated and hardworking and enjoyed a rewarding career as a registered nurse. When not working or with family she loved to spend time travelling and collecting jewelry. She will be dearly missed but lovingly remembered by her many family and friends in Ontario and New Brunswick. As per Jean’s wishes cremation has taken place. An interment service will take place at St. Philips Anglican Cemetery (31 St. Philips Road, Toronto) on Saturday, June 16, 2018 at 11:00 a.m.